Rabbi Benzion has been teaching the Jewish Year Diet for over 25 years. As a health practitioner, Benzion has given formal lectures both in Israel and abroad. He was also invited to teach the head doctors at Bikur Cholim Hospital in Jerusalem after he helped to cure a patient of her diabetes. In addition to counseling about the diet, he also runs a “healthy meals” program in the Old City of Jerusalem, which includes food deliveries and cooking classes. Rabbi Benzion has smicha (rabbinical ordination) from the Rabbinute of Yerushalayim together with a certificate signed by most all the chief Rabbis of Israel. This is a fitting continuation of his lineage, as his parents of blessed memory both come from a long line of European Rabbis, including the Chofetz Chaiyim and other poskim. Spending over 20 years as a full-time student at the Diaspora Yeshiva on Har Zion (Jerusalem), he eventually became Rosh HaYeshiva (Head of the Yeshiva) of a branch of the Diaspora Yeshiva in the center of Tel Aviv. 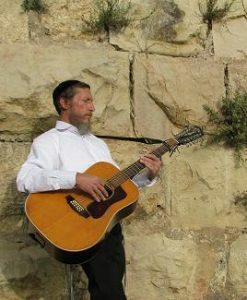 The success of the Yeshiva came largely because of Rabbi Benzion’s charisma emanating from his wide spectrum of Torah, together with his musical abilities and knowledge of health. Rabbi Benzion attributes the blessings of Chidushei Torah (new insight) that Hashem gives him to intense Torah learning and prayer, combined with the Jewish Year Diet. Together with his student, Yitzchak Krimsky, they are now putting together JewishYearDiet.com in order to offer this essential knowledge to the innumerable community of internet users. Yitzchak, who was the Nutritionist in The Natural Gourmet (an all kosher health food store in New York), along with a background in Acupuncture and alternative medicine, was studying in the old city of Jerusalem when Divine Providence connected him with Rabbi Benzion. Yitzchak, after seeing the first-hand effects of the Jewish Year Diet, along with sitting in on Rabbi Benzion’s counseling sessions, decided to work hand-in-hand with Rabbi Benzion to organize the information for the general public.